Check out our range of dispensers and organisers for your favourite Post-it® brand products. We have stylish dispensers for your Flags and Pop-up notes to aid productivity and organisers to store your pads, flags, tapes, pens and pencils to rid your desk of clutter! Liven up your desk with this high fashion dispenser that resembles a colorful compact that fits easily in your purse. With this designer aqua compact for the purse-shaped dispenser, notes will always be within reach. Compact size, sturdy plastic construction with weighted base for easy one-handed dispensing. Can be refilled with any 76 x 76 mm Post-it® Pop-up Notes. Pack includes dispenser and a starter 90-sheet pad of pink pop-up notes. Increase productivity and show some heart at the office. With this playful pink heart-shaped dispenser, notes will always be within reach. Pack includes dispenser and a 50-sheet pad of pink pop-up notes. Designer Apple dispenser brings fun and functionality to your office. Convenient one handed dispensing from a unique apple-themed weighted dispenser. Pack includes dispenser and a 50-sheet pad of pop-up notes. 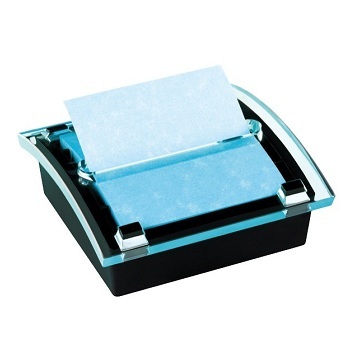 Stylish European design dispenser for easy one-handed dispensing and keeps notes organised. Features a clear acrylic top with a weighted black base. 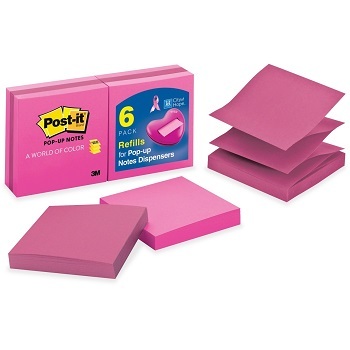 Pink Post-it® Pop-up Notes for use with Pop-up Dispensers. These unique fan-fold, accordion-style Pop-up notes pop up for one note, one hand convenience at your fingertips. Marseille Collection Pink (two shades) original self-stick, repositionable, pop-up adhesive notes. Organise your workspace with this stylish Post-it® C-50 desktop organiser. Reduce desktop clutter by keeping note pads and supplies neatly organised and within reach. Weighted base. Features built-in tape dispenser and additional compartments for note pads, pens, pencils and paper clips. Black Organiser complete with Post-it® Notes, Flags and Magic™ Tape samples. Keep your flags handy with this stylish European design dispenser. 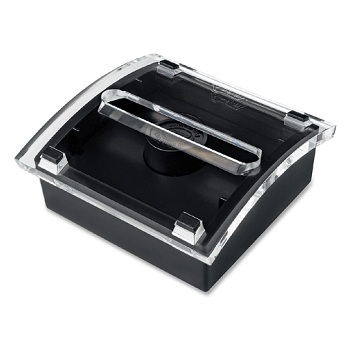 Feature a clear acrylic top with a weighted black base for easy on-handed dispensing. Can be refilled with combinations of Post-it® standard and/or mini flags. Pack includes dispenser only - Flags are not included.